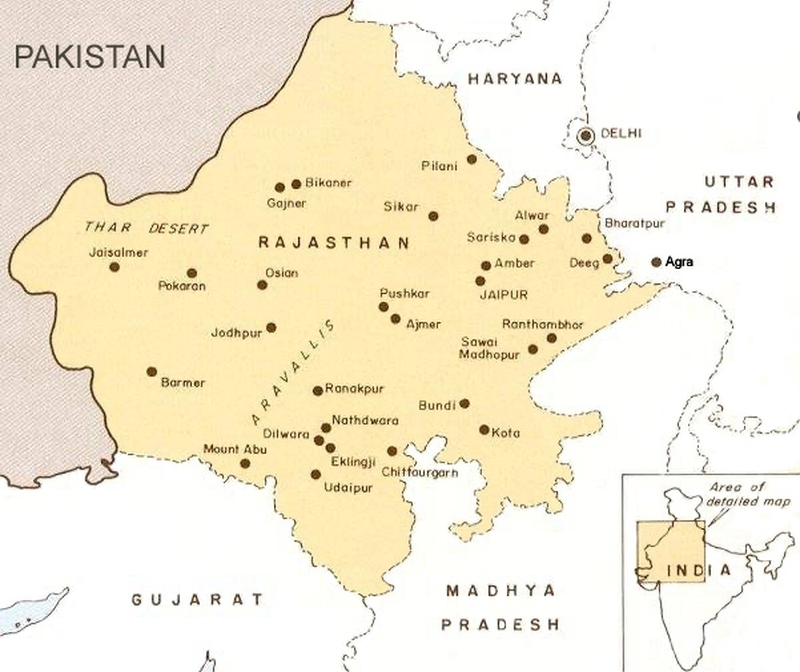 The Indian state of Rajasthan, snuggled in the northwest part of the nation bordering Pakistan, continues to be one of the most popular tourist areas of the country. Whether you wish to explore palaces or forts, traverse desert byways, befriend camels or elephants or scrutinize the methods of an exotic snake charmer, Rajasthan is the place to visit to see it all within an easy commuting distance. As with many cities that grow out of the desert, Jaisalmer is a marvel unto itself in occupying a spot in the middle of the Thar Desert. Although there are buildings designated as forts, they also served as the residence of the regional ruler. Jaisalmer Fort is one of such example as its sandstone walls rise seemingly like magic from the desert floor. There are two estates – havelis – in Jaisalmer that are fascinating examples of Indian architecture. Nathmal ji ki haveli built by two brothers who built it from opposite ends without checking each other’s work resulting in a most peculiar shape. It ranks as one of the most flamboyant of the havelis in all of India with its elephant statues guarding the entrance. Bundi stands out among other cities of the region for two features. The first is Taragarh Fort sitting atop a hill overlooking the city and the second is Bundi Palace which is right next door. Both are distinguished for their wall paintings and frescoes. Bundi is one of the only places in the country that developed its own school of art and created an individualized painting. Bundi exemplifies ornate architectural features and the unique style of murals recognized worldwide. Junagarh Fort is one of the most outstanding features in Bikaner. Built by Raja Rai Singh in the early 1600s as a palace-fort for the royal family, it now houses a museum that displays weapons of that period as well as many of the intricate ornaments from the 19th century. When going to this city, you should know that the only way around is by horse carts since the streets are narrow and the sandstorms may disrupt the functions of cars. Bikaner houses the Camel Research Center where you can learn about the different breeds of camels and even taste camel milk ice cream if you dare. Udaipur is no doubt one of the popular places to visit in Rajasthan. Nicknamed “Venice of the East”, the first thing you will want to see is the strikingly beautiful Udaipur City Palace, which once was the home of the Maharaja of Udaipur before it became part of India in 1947.One of the complexes is now a luxury hotel. The palace is situated in the middle of Lake Pichola which reflects its ornamentation giving a feeling of fantasy. Actually, the palace is a potpourri of several ethnic architectural designs including European, Rajasthani, Chinese and Mughal. This is the city to take advantage of the Jeep Safaris and the Camel rides in the Thar Desert. Both will take up an entire day but worth the time. Jaipur is tagged with the moniker—“Pink City,” because the buildings were painted red to mimic the Mughal cities; but in the late 1800s, when the Prince of Wales first visited, the red was closer to a vibrant pink as the sun hit it at sunset together with the effect casted upon and highlighted by white motif borders. The Amber Fort is the place to visit if you can only visit one place in Jaipur. The architecture is a mix of Hindu and Islamic design as this region’s religious influences bounced back and forth between the two. Inside the palace-fort is the Sheesh Mahal decorated with hundreds of thousands of mirrored tiles each made by hand and installed one at a time by master craftsmen. This National Park is probably the most famous Tiger Reserve in the world. But, tigers are not the only wildlife that live here. There are more than 250 bird species including some of the rarest on the planet. Three varieties of storks live in the park and are often seen during the Tiger Safaris that take you around the park. These include the Black stork, the Painted Stork and the White-Necked Stork. Ordinarily, Pushkar’s atmosphere is best described as drowsy as it supervises the peacefulness of the lake overview. Pushkar is the holy city of the Hindus because it is the home of Lord Brahma. As a matter of fact, this is one of the very few places in India where you can visit a Temple dedicated to Brahma, the Creator. Therefore, it is also one of the wonderful places to visit in Rajasthan. If you can get a place to stay, try to arrive during the Camel Fair when the city awakes, turning into the most extravagant, robust city in the nation – only to fall back into its deep sleep after the Fair is over. The Camel Fair takes place for 10 days in November. Jodhpur is one of the legend cities of India with many activities and sites for tourists to explore and enjoy. At the very edge of the Thar Desert, the former capital of the state of Marwar, Jodhpur’s night lights spill over the wall encompassing the city into the emptiness beyond. This is one of the oldest cities in India. According to the history, the chief of the Rathore clan of Raiputs, Rao-Jodha is the person who created it. However, Rao-Jodha made public claims that he was the direct descendant of Rama, a notable hero of Ramayana. Bharatpur is another of India’s walled cities that sprung up during the period when rulers fought their neighbors for more territory and were being attacked by outsider forces trying to take the cities for their own. The celebrated Keoladeo Ghana Bird Sanctuary is one of the favorite spots for visitors and locals alike. This water-bird sanctuary is a pleasant diversion from the desert surroundings. The sanctuary was originally the solution for finding a way to entice and confine the wild cattle that roamed the desert by providing an oasis for them to use. Shekhawati is a Region of Rajasthan rather than a city, but it is still one of the best places to visit in Rajasthan. The region grew up on a main caravan route and as a result, more than 100 villages and 50 forts were built to protect the residents and host the traders. For those who love the artistic flare of India, this region is known for its painted havelis. Watch the video below to virtually explore some of the beauty of Rajasthan.